Born Punk is a narrative- and puzzle-driven cyberpunk pixel art point & click adventure in the style of classic 90s games. Accompany Eevi, a former corporate hacker, as she tries to understand why and how her cyber-implants were infected by a rogue AI. 919 backers pledged AU$ 48,301 to help bring this project to life. Born Punk is a point & click adventure! It's a cyberpunk adventure! It's science-fiction too! Now that the buzzwords are out of the way, let us explain this in a less sensational manner: Born Punk is a game in the style of the 80s and 90s point & click classics like Monkey Island, Gabriel Knight and Beneath A Steel Sky, that wants to deliver an intriguing storyline and logical, non-outlandish puzzles - which admittedly, were a bane of ye olden games. We want to combine the best of both worlds, the old and the new: keep what made point & clicks great, and replace what made them tedious. Last but not least, Born Punk is a love letter to hope: even though cyberpunk traditionally is a dark and edgy genre, we firmly believe that most forms of popular sci-fi (and cyberpunk is definitely part of sci-fi!) delve too deeply into 'depressive territory'. Whilst we are here to tell a story about tragedy and strife, we also want to tell a story about how in the middle of despair and anguish, there's always an acorn (or even loads of them!) of hope to be found. Actions (and gameplay demos) speak louder than a 1000 words! Please feel free to download our demo (for Windows, Mac, and Linux) to test our game for yourself here. And now, let's get to the nitty gritty details. Choices and consequences: often, it's possible to approach dialogs and puzzles from different angles. As a result, potential interactions with other characters, the difficulty to overcome certain obstacles, and the results of some actions will be slightly to majorly different. A comprehensive cyberpunk universe: there's lots of background info to read and experience, which gets added to your PDA as you continue to interact with the gameworld. Lore nerds should be happy about this! Sometimes, in-game lore will also serve as a gameplay mechanic. Full voice-overs: every character in Born Punk and every line will be voiced. Our main character's voice actress, Linsay Rousseau, previously worked on Elder Scrolls: Legends, Fallout 76, Sailor Moon, and for Blizzard! Cyberspace: the main character can enter the global net and surf through a VR world full of weird online personas and deadly counter-measure programs - meaning that the 'hacking' part of the game will be a much more wholesome experience than a simplistic mini-game or quicktime-event. Graphics/Animations: our graphics and animations are done by Indrek Plavutski, formerly of Wadjeteye's Blackwell: Deception! We try to capture the charm of the 90s, and mix in neat particle effects from today. Veterans and newcomers welcome: Born Punk will not cater purely to nostalgic purists nor to hyper-modern tastes; we don't try to dumb things down to appease a streamlined gaming market nor are we trying to make things needlessly complicated just to stay true to the classics. Let's be serious, it's funny: it's cyberpunk, but with a hopeful, often humorous undertone. Point & click adventures without at least a bit of humour are unthinkable! Please do pledge here on kickstarter if you can, but if you for whatever reason absolutely can't, please follow this link, which will take you to our PayPal donation page. There, please put in the $$$ amount that you want to pledge. If you are pledging at a level that will result in physical rewards for you, please also add your name/address. If you're going via the PayPal route, thank you so much for supporting us by taking those extra steps! The game follows Eevi Rinasdottir, a former corporate combat hacker. Eevi grew up in the bad parts of Bornholm - of which there are many in 2155 - and was forcefully recruited by a mega-corporation called Mitsotomo. One decade later, Eevi was forced to return to the place of her humble beginnings, to work as a barkeep for her foster father, and to dream of returning to the glittering corporate lifestyle she had grown used to. In the game, we meet Eevi as she is suffering an ungodly hangover, trying to prepare for a nightly 'data drill', a freelance hack meant to extract enough critical data from random targets to finance her comeback. What she doesn't know is that an electronic entity has infected her cyberdeck (think brain-computer-implant). At least at first glance, this entity - likely a rogue AI - seems just as confused about the situation as Eevi is. As the story advances, the player will seek answers about the nature of the intruder, either come to terms with it or try to expel it from her body, struggle with suffering from what is essentially a digital multiple personality disorder (imagine having a self-aware talking program forced into your brain! ... actually, that sounds kinda cool), and ultimately uncover a conspiracy that could change humanity's future forever. 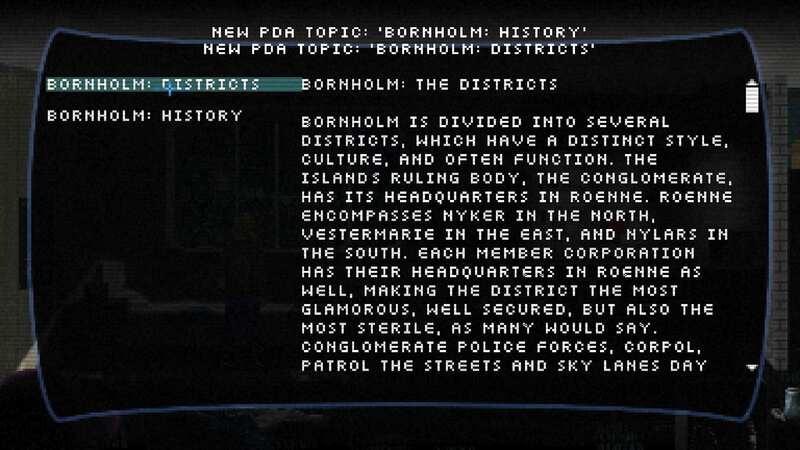 As should be painfully obvious by now, the game is set on the island of Bornholm, which is a Danish territory IRL. By 2155 - the year the game takes place in - Bornholm has transformed from a quaint holiday getaway with some interesting history to a proper mega-city, governed by a corporate council called The Conglomerate. Most importantly, the island hosts a space elevator; a gigantic construct used to transport goods and people into orbit for a fraction of the cost traditional methods would be able to. This has made the formerly obscure region a hot spot of 22nd century geo-politics. The final amount of locations/scenes in the game will heavily depend on our kickstarter success, or lack thereof. Should things go as we want and hope they will go, there will be about 40 different scenes in the final version of Born Punk. These scenes will include the bar 'On the Ragnarocks', various funky neon-coloured scenes in cyberspace itself, the seedy parts of town, the glittering streets of downtown Bornholm, a futuristic harbour, the local space elevator, and last but not least, one or more scenes in SPACE! You may not be as excited as the writer of this blurb, but come on, IT'S SPACE! It is not guaranteed though that you will see each and every one of these locations during one playthrough, as the decisions you make during gameplay may affect the storyline in a way that locks you out of certain progression paths. We do love us some choices and consequences! Jeff Kurtenacker, composer of the bombastic soundtrack of the MMORPG Wildstar and former World of Warcraft choral arranger, is keen on delivering a VERY high quality soundtrack. I encourage you to check out his work on Wildstar here. Apart from Jeff Kurtenacker, we have two professional musicians (Javier Morales and Greetings Program) working on atmospheric tracks that will be playing in the background, tailored to dynamically switch according to the situation at hand. As so many things in regard to this production, our timeline depends entirely on our success on kickstarter. As the gameplay demo explains (please do play it if you haven't yet), we will finish the game no matter what, but I can't possibly give you any sort of precise timeline. In the case of everything going smoothly on this platform, we expect the game to be in development for 12 to 18 months. ID22's lead is Falko. Falko has been a (PC) gamer ever since 1984. Sierra and LucasArts adventures were some of his most memorable experiences as a small child and teenager alike; memories that most definitely shaped his taste in games. In the late 90s, Falko developed a couple of freeware games, but was drawn into 'real life' too much to make a business out of that hobby. Four years ago, Falko closed his business consultancy and translation business of 8 years, to move with (and for) his wife to Australia. "In many ways, the work of a critic is easy. We risk very little yet enjoy a position over those who offer up their work and their selves to our judgement. We thrive on negative criticism, which is fun to write and to read. But the bitter truth we critics must face is that, in the grand scheme of things, the average piece of junk is more meaningful than our criticism designating it so." Falko is joined by Indrek, an enormously talented graphics artist from Estonia. Indrek is blessing Born Punk with his love for both point & clicks and pixel art alike. Previously having been a background artist for Blackwell Deception by WadjetEye Games, as well as an industry designer, Indrek is able to contribute not only with his raw creativity, but also by counseling Falko on the intricacies of game developer life that he has experienced. Indrek is responsible for all animations and background graphics. Jean Czerny, an architect and friend of Falko, is contributing concept art, maps and architectonic advice. He contributed to the movie Dwarves of Demrel as a concept artist and worked as an illustrator of card game Godforsaken Scavengers. Jean being a professional artist. If you would like to stay up to date with the game development, you can follow us on the sites listed below. Please be aware that twitter and discord will be the main platform for public updates. All of these are possibilities, but as rational, thinking people, I hope you are quite aware that a million things could happen that would result in us not finishing this game. There is no promise we could possibly give, because promises in a world of financial uncertainty are simply impossible. The only promise we can give is that we are going to do our HARDEST and our BEST to create an exciting, awesome, and finished point and click adventure for you. Because we love games, this project, and we love entertaining people. So this is our promise. We will TRY. Being Born Homeless is a tragedy, but even the homeless can have big and open hearts! This tier is for you if you just want to; stay informed about Born Punk via our regular updates, or if you lack the credits to afford the full game yet still want to support Born Punk, don't want to contribute too much, or have no interest in the game but want to get rid of some monetary units anyway. This is the only tier that does NOT include the finished game. The majority of people in the Born Punk universe are from the lower classes - but as we all know, those are the people who (literally) build society! Just like these industrious people, you have chosen to help ID22 be industrious too. Lucky to be a Born Citizen, the astute and well-educated you has chosen to support the making of our game, but wisely demand some acknowledgement and compensation in return! Pledging on this level will give you a second copy of Born Punk once the game comes out, as well as the game's concept art and soundtrack DLC. Most importantly, to honour you fine citizen, you shall be immortalised in the game's credits! The game's Concept Art DLC and Soundtrack DLC! - a shout-out on 'Radio Peak Bornholm', an in-game radio station bringing the player the latest news and hottest music. - Access to ID22's upcoming monthly developer streams, so you can make sure for yourself that your investment is being used wisely. A shout-out on 'Radio Peak Bornholm', the in-game radio station! Corporations may be providing well for their employees, but there's nothing as prestigious as having been Born in the Purple. True nobility trumps the delusions of grandeur of those upstarts every day. - Access to regular test builds of Born Punk, allowing you to see with your own eyes how the game is coming along. - We will integrate your name into Born Punk's lore, meaning that your name will appear as a historical character in the game's lore PDA (as a friend of our main character? A dictator? An important scientist? A corporate CEO? Who knows!) and may even be talked about during the course of the story. Your name as part of Born Punk's in-game lore! This tier is a recent addition to our campaign. It was introduced after we reached the radio stations stretch goal, and is meant to accomodate those who are Born Radio Voices! It comes with all perks of the previous tiers, but additionally, the inclined backer will be able to send us a silly or serious in-universe and in-character non-immersion breaking audio line asking the show host of Born Punk's call-in radio show a question or making a statement. The radio host will respond, and the conversation will be featured in the game. So... if you think you're a Born Radio Voice, this is the tier for you! We will not be able to display this particular reward in the other tiers due to the campaign already underway, but it is part of all higher tiers as well. Your voice in the game, in the form of a radio segment! Being Born in the Purple is nice and all, but what is nobility worth if you're still inhabiting a human body, that isn't even cybernetically enhanced? Pft, those meatbags are the past, augmentations are the future! Another thing that will happen in the future if you choose to pledge on this tier is that Falko, lead of Insert Disk 22, additionally to all previous rewards, will record a personalised video just for you, in which he will answer up to 3 question of yours regarding the game. Or the world. Or himself. Or the chance of you finding the love of your life. Please have questions about the game instead. Please. Finally, we will give you access to a special VIP room on the Insert Disk 22 discord server, in order to have a direct line to us and to have the opportunity to enquire about our progress (or just to chat) at any time. A personalised video from ID22 for you, answering your questions! There are those among us who are so generous, that they may very well be Born Superhuman. By choosing this tier, you are providing ample evidence for this outlandish claim of ours. - A signed postcard created by ourselves, featuring a Born Punk theme, expressing our deepest gratitude for your generosity. - We will incorporate either your face or the face of a loved one into the game-world. It may appear as graffiti, on the TV, in a painting or photo. It will be prominent (or ridiculous) enough to not be overlooked, that we can promise you! - We will also give you a second additional digital copy of Born Punk. TWO additional digital copies of Born Punk! A signed Born Punk-themed 'Thank You' postcard from the devs! Yours or a loved one's face as a poster/picture/graffiti in-game! Thought that creatures who were Born Superhuman were dope? Wait until you meet those that are Born Demi-God, I'm telling you, those are the best! Noble, gracious, and incredibly good looking! - a Born-Punk themed t-shirt, designed by ourselves, in a size of your preference! - We will draw an in-game character according to your specifications (maybe a photo of you, or the photo of a loved one). The character will be a non-story-relevant NPC with dialog or monolog. You will be able to decide - together with us- one line that the character will say to the player! - We will also give you 3 additional digital copies of Born Punk and feature your name more prominently in the credits. Because you deserve it. Three additional digital copies of Born Punk! Your name in the in-game credits, but prominently! A in-game character drawn after you, with its own line! How can one possibly describe someone who is Born God? Well, obviously as the most generous being alive! Please ignore the logical inconsistency should there be more than one of you fine beings on this tier. But then, gods are not always the most logical beings. This god-like tier will give you all of the previous rewards, but instead of merely creating a character to your specifications, we will also model their name and mannerisms/personality after you! You will - together with us - be able to define how the character behaves in the scene(s?) that they appear in, and help forge the character's reactions and dialogue. But that's not all. This is the first tier that gets you a classic physical boxed copy of the game! The box will come in a 90s style format, will have artsy art on the cover, and will include an artsy arty DVD [DVD WILL HAVE PC/LINUX/MAC VERSIONS ON IT], all the other physical rewards of your tier that fit in there, and a personal thank-you letter. But that's still not all! On this tier, you will be able to design a radio commercial for Radio Bornholm together with us; maybe you want to come up with your own cyberpunky corp advertisement? You can! Since you are Born God, you of course already know this, but we will give you four additional digital copies of the game. Four additional digital copies of Born Punk! An in-game character drawn, named, and characterised after you! Design a Radio Bornholm commercial with us! OMGWTFBBQ. What else is there to be said, but OMGWTFBBQ. Not much, because that's the epitome of awesomeness. YOU are the epitome of awesomeness. You are OMGWTFBBQ. As a third 'thank you' from us, you will receive Born Punk's soundtrack on a proper CD. People still listen to CDs, right? Well, if not, it's never too late! Finally, if you send us a picture of yourself (either the one for your character, or a different one), our concept artist Jan will transform you into a Born Punk-style cyberpunk character in the form of a digital drawing/painting! Five additional digital copies of Born Punk! A cyberpunky digital painting of your face by our concept artist! Born Punk's soundtrack on a CD! It is hard to describe those that are I'm-Running-Out-Of-Names-Here. I mean, how does one describe the awesomeness of such awesome people, without sounding like a used ship salesman? We know of only one way to do so. By giving you your own TV show! If you pledge on this tier, not only will get you get all rewards of previous levels, but you will also be able to design a TV show with us, which will air on Bornholm's premier TV channel (watchable in a couple of in-game scenes). Do you want to design an android dating show in which YOU meet the robot of your dreams? Or a soap opera in which you take on the role of a hot-blooded lover in virtual reality? Now you can! Most tiers offer more than one additional reward, but in this case, we think this particular one is... well... cool enough to stand on its own! Your own TV show on Bornholm's TV station! If you thought that the notion that someone would pledge 1000 dollaroos was nuts, then the notion of someone pledging 2500 dollaroos should drive you properly insane! It certainly does that for us! You could buy a computer for that money which could play Born Punk in at least 500 different windows without crashing! This is not what the wonderful, lovely, and perfect people on this tier will get. Instead, they will get the rewards of all previous tiers, but the time with ID22 in Melbourne will be increased to a whole weekend. Because why should fun and sharing of ideas be limited to just one day? Additionally, your name will appear in the credits as 'Executive Producer' - a tradition in the film business for patrons of the art. Why should we not do the same in gaming? Last but not least, we will upgrade two of the previous rewards even further. The character we design with you will be crucial for the story, and the importance of your name in the in-game lore will increase further; your historical character will have altered the course of Born Punk's universe. 'Executive Producer' title in the credits! Patron saints are extremely rare creatures, especially in cyberpunk worlds. Probably out of fear of getting mugged, or having their organs harvested by some low-lifes on the streets. But fear not, oh noble being! No such thing shall happen to you if you pledge this incredibly generous amount of dollaroos! - an in-game location named after you; this could be a nightclub, a street, or even Bornholm's space elevator itself! - an inventory item named after you; perhaps Eevi's laser pistol will have your name as its nickname, or a puzzle-relevant item will have been produced by a company named after you! - an artful cloth map of Bornholm! - your name listed as 'Official Sponsor' in the game's intro video! An in-game location named after you! An inventory item named after you! A cuddly Born Punk plushie! An (awesome-looking) cloth map of in-game Bornholm! Your name listed as 'Official Sponsor' in the game's intro! You know, it's never bad to dream big. And having someone pledge on this tier? That's dreaming really big. So big, that it is so incredibly unlikely for someone to actually go through with this, we can offer a ridiculous reward. Don't get us wrong, we WILL follow through should it happen, but... COME OOON, IT'S NOT GOING TO HAPPEN! As someone Born Come-On-No-One-Is-Going-To-Do-This, you get all the rewards of the previous tiers, but Falko, the head honcho of this project, is going to fly to your city, and discuss the game's development with you over the course of a weekend, making you part of the design process of the game itself. Falko flies to you to spend a weekend discussing development!